Map-Pak works on the Google Map platform, the most powerful and cost effective mapping application on the market. Easily view and display all routes and their stops from the Soft-Pak dispatching center. Click on any stop to verify account information and services performed. Select any criteria to view various route types… example: same day routes, weekly routes, or different route types on different days. Visually identify overlapping stops and make the necessary changes to move stops and improve efficiencies. 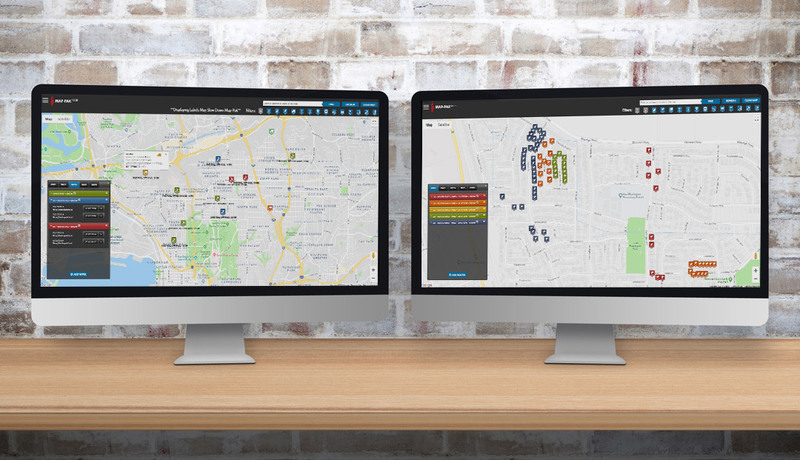 View vehicles GPS location in real time to make dispatch decision on the fly. Map-Pak works in conjunction with Mobile-Pak, by displaying the location of all active mobile devices on the Google Map display. Provide your clients with better service while reducing drive time and dispatching errors. View driver locations in real time to help make judgment calls for on-call dispatched work. Save time, money, and manage your entire fleet while optimizing scheduled and unscheduled routes.